I cannot imagine being a mother decades ago. Let me talk about my two favorite inventions. The first is the DVR. This is a miracle machine. Not only is it great for me because I can pause Project Runway to go grab the laundry but it's fabulous when you have a two year old that only wants to watch Elmo. Yes, I've used the TV Babysitter method a few times. Don't judge me because I love it. I certainly don't let Christopher lay in front of the TV all day long. But there are times when I need a break and the TV works really well for those situations. The fact that I can start Elmo's World in a matter of seconds is fan-freaking-tastic. I remember the days when the channels were limited to the clicks on the knob. I also know that television wasn't always available during those midnight feedings. But for me, I don't know what I'd do without my DVR. Don't get me wrong - I could live without a television. I could certainly live without a DVR. But that doesn't mean that I want to. My second favorite technology invention has to be Skype. I hate to single out one video calling company, but from what I've experienced, Skype is the best. We originally set it up to talk with Nana, Brian's mom, when she was sick. We wanted her to be able to see Christopher whenever she wanted. Especially since she lived in Atlanta and we lived in St. Louis. Unfortunately those calls weren't very often and often difficult because of the other web based video calling companies we used. Since we've moved to Skype, we've been on the computer interfacing with GaGa and PopPop almost every other day, if not every day. The picture is amazing as well as the sound. It's as if the person is in the other room. Christopher has his little quirks during the video calling which are so adorable. For those of you who don't know, my parent's run an animal rescue from their farm. They usually have 60+ dogs at one time. Most of the larger dogs are down in the kennel while the small dogs are up at the house. 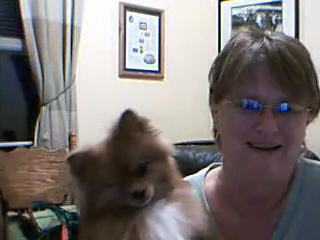 Christopher loves talking to these dogs through Skype. He's also been able to remember all their names and asks for each one independently. Wicket is my favorite for a couple of reasons. One, he's a Pomeranian, you gotta love that. Two, he's blind. And Three is because Christopher can't pronounce "Wicket". Instead he calls him "WeeWee". 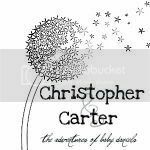 It's absolutely hysterical to hear Christopher screaming WeeWee! WeeWee!!! Once my mom picks him up and shows us, Christopher will reply, Look Momma! It's WeeWee! Hi WeeWee! It's also cute because when Wicket can't see Christopher when his name is called. So he just continuously turns his head from side to side like an Ewok. It's like Wicket knows he hears a baby, but also knows he's not really there. After Wicket, Christopher moves on to Betty, Eddie, Moose, Boomer, Milly, and anyone else he or I can remember. Once we've gone through all the dogs and Christopher has shown GaGa or PopPop any new tricks he's learned it's time to sign off. But that's not before we give kisses and hugs. Oh yes, Christopher will kiss the screen and then step back only to reach forward again to hug the laptop. It may be the cutest thing I've ever seen. That's it for today. We're getting ready for Christopher's birthday next week. On Sunday we're having a small family party. Brian talked me into making a practice cake before Sunday night. 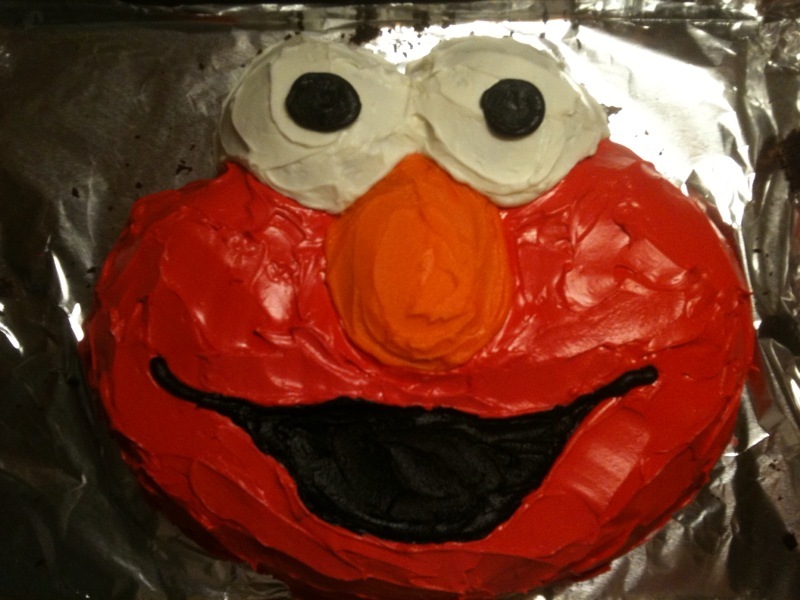 I'm making an Elmo cake, and it went fairly well. That was until my Dalmatian, Susie, decided to climb onto the counter and eat half of it. That was fun. Thanks Brian. The practice cake picture is below (before it was eaten buy a crazy canine) and you can be the judge to see if I do any better the second time.